While we drink Scotch year-round, the fall and winter pair most perfectly with rich and warming whisky. And fortunately, brands across Scotland are releasing a range of new bottlings that you need to try. Sláinte! The rumors you may have been hearing are true: Johnnie Walker Green Label and Gold Label are going away. But the Scotch stalwart just introduced Platinum Label, which is a smooth blend of whiskies at least 18 years old that contains plenty of spice and a bit of smoke. To honor its long-serving master distiller Dennis Malcolm’s 50 years on the job (he started as an apprentice cooper at age 15), Glen Grant has brought out a very special spirit. It’s comprised of Malcolm’s favorite malts from, you guessed it, each of the last five decades. The finished product is sweet and fruity with hints of peat. 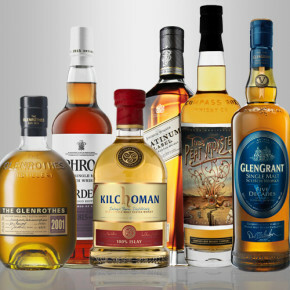 The Glenrothes specializes in bottling whisky from a particular year, which means that every one is unique. The 2001 vintage is no exception: The quaffable 12-year-old was matured in four different types of barrels and has notes of apricots and baking spices.